Phew. I spent 3 hours this afternoon organizing the girls' clothes. I had them semi-organized in a chaotic fashion (I knew where everything was), but it was slowly getting out of hand! So I decided to go through all their clothes and organize them for good. I started with three piles: factory-made (Takara), vintage, and handmade (the largest). Then I tackled the Takara pile first - separated them into different stock sets and put them in all individual ziploc bags. Now I can go to the French Trench bag for the blue dress, the Love Mission bag for the blue shirt & tie, the Samedi Marche bag for the apple apron, etc. No more digging around! Next was the vintage items - Barbie, Skipper, and other various unknowns. Those were easy. The biggest pile was the handmade, and I am very proud to say so - I love handmade dolly clothing and I love supporting fellow dolly seamstresses! Soon I was sitting on the floor with itty bitty dresses, pants, tops, hands, skirts all over! I should have taken a photo but I was having too much fun. 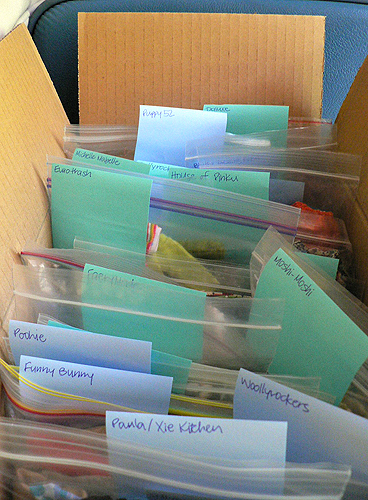 I ended up separating the handmade clothes by designers, putting them in ziploc bags and then boxed, as you can see above. I also have a big gallon size that has one-offs, and another for everything I've made - prototypes and seconds - the girls get to keep. Now I can see what I have and dress the girls better! Just in time, too. We're looking forward to a meet next weekend. I wonder who will be coming along with me to meet new friends? :) We'll be bringing a big bag of stuff to give away! Hats, hats, and more hats! I love them and so do my girls. 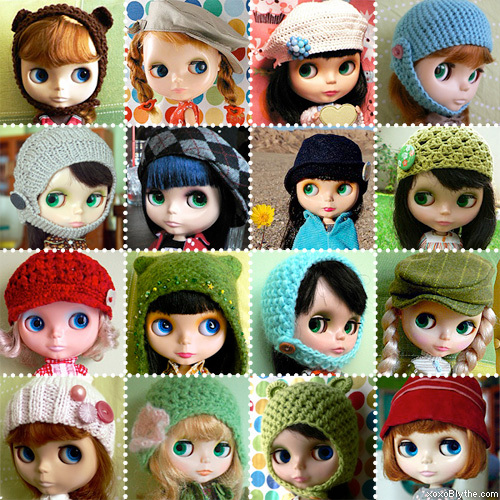 Here they are wearing some of my hats as well as some of my favorite Blythe fashion designers: Blythely Jean, Drop Dead Cute, Blythe 525, Simply Kir, Tiny Haus, EuroTrash, and Tibiloo! I'm especially fond of girls who look nice in hats. Maybe it's because I'm not much of a hat person myself - I love hats, but I just don't think I look very good in them. 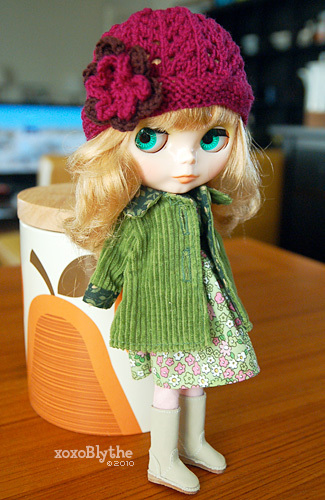 Since my Blythe girls look great in hats, I try to put hats on them whenever I can! Olive, the latest girl to join the family, is modeling a new hat I just finished. I didn't use a pattern, just sort of eyeballed the size and went from there. Just make sure you are making it in multiples of whatever stitch you are doing, then make a swatch and guess from there, roughly around 11" circumference. Then decrease when you've got a good height. I'm proud of myself for learning the basics of crochet because I crocheted the little flower! 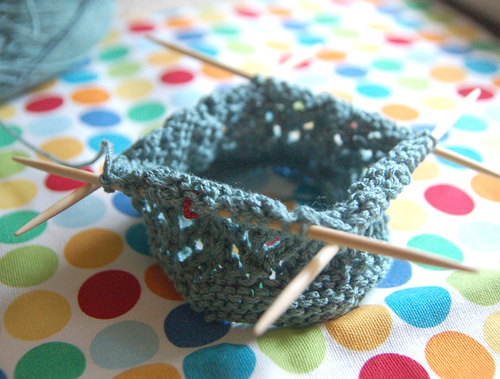 I've always been more of a knitter than crocheter and wish I could crochet. I was so happy when I found the pattern for the little flower online at Ravelry. It was easy to follow, and all I had to do was look up all the acronyms in my trusty Teach Yourself Visually Crocheting book! I would like to try amigurumi sometime, but all the patterns I've seen look so complicated and overwhelming. In the mean time I'll just keep practicing making little flowers! More hats are being made and will be available on my Etsy shop sometime soon. I will be announcing them on Twitter and Facebook when they're ready! It's been a while since I knitted anything Blythe-size. I've been knitting so many people-size things, it feels so fast and makes me feel accomplished! Yarn used is TLC Cotton Plus in Spruce, DPNs are size 6.